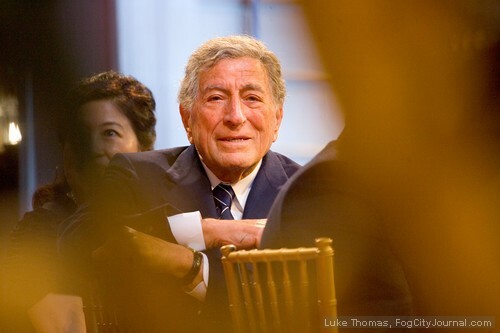 Tony Bennett, beloved singer of "I Left My Heart in San Francisco," was honored at City Hall on Valentine's Day. The song he made famous was celebrated for 50 years of romanticizing the City of San Francisco. Photos by Luke Thomas. Mayor Ed Lee and his Chief of Protocol, Charlotte Maillard Schulz, gave the biggest Valentine to the citizens of San Francisco and their beloved troubadour, Tony Bennett, yesterday. They threw a party in City Hall celebrating the 50th anniversary of the legendary song, “I Left My Heart in San Francisco.” And, they gave the key to the City to Bennett. The rotunda was festooned with pink balloons and red roses. Citizen guests excitedly took seats under the dome and gathered at all the balcony rails. Dignitaries were ushered to their reserved seating at the foot of the grand staircase. Voice of San Francisco Giants, Renel Brooks-Moon, was the mistress of ceremonies. “We salute a living legend today,” she said, “Tony Bennett, our beloved troubadour.” Bennett descended the grand staircase, holding the hand of the Mayor’s wife Anita Lee. Performances of the legendary song were given by the San Francisco Girls and Boys Choruses along with Ruth Asawa School of the Arts choir and later by the San Francisco Gay Mens’ Chorus. Fifty years later, “I left My Heart in San Francisco,” has become an institution, especially at the Giants’ ballpark. Larry Baer provided a tribute to Mr. Bennett which included the announcement that a permanent place of honor is set aside at AT&T Park – Suite Number 1 will be “The Tony Bennett Suite.” “You are a huge part of the San Francisco Giants, Tony,” declared Baer. A video of famous San Franciscans was played for all the guests, starring Chief of Protocol Schulz. Bennett received tributes from Cissie Swig, Nancy Pelosi, Dianne Feinstein and Willie Brown. Mayor Ed Lee commented that it was fitting that so many students were performing in the day’s ceremony because Mr. Bennett works to ensure that arts education is accessible to youth through his work with the Frank Sinatra Foundation. 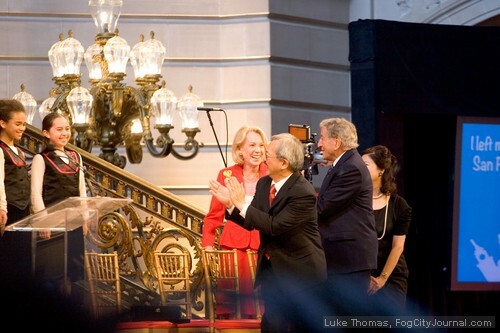 Mayor Lee declared the day “Tony Bennett Day in San Francisco,” and presented him with a key to the City. Bennett, who did not sing, gave a little speech. He first learned about “the song,” when he was in Little Rock, Arkansas (yeah! That’s my hometown!) He began to work on the song with Ralph Sharon, testing it out at a local bar. The bartender told him, “If you record that song, I’m gonna be the first customer.” So, Arkansas made the song famous. Bennett was clearly touched by the young choristers that performed “his” song. “I’ve never seen anything in my life as beautiful as these young people,” Bennett said. Tony Bennett applauded the choristers who sang their own rendition of "I Left My Heart in San Francisco." Bennett referred to the youth as a beautiful sight. Bennett, who is 85, has said that he will never retire. Indeed, he keeps on distinguishing himself. He just won two Grammy awards last Sunday, for his work on “Duets II.” He has 17 Grammy awards and is the oldest living performer ever to hit the Billboard Hot 100. In the wake of the deaths of Amy Winehouse, with whom he paired for the duet, “Body and Soul,” and Whitney Houston, Bennett has called for the legalization of drugs. Kat Anderson is a graduate of Hastings College of the Law and Stanford University. She has made San Francisco her home since 1988. Wins Key to San Francisco are now closed.